I utilize a variety of tools and frameworks in my coaching practice which I have gathered over time from a variety of resources. When I make reading recommendations it is with the intention that my clients will find insights that will enhance their coaching experience. Here are a few of my favorites. David Rock writes “If people are being paid to think isn’t it time the business world found out more about the thing doing the work, the brain, is all about?” Supported by the latest groundbreaking research, Quiet Leadership provides a brain-based approach that will help business leaders, executives, and managers improve their own and their team’s performance. 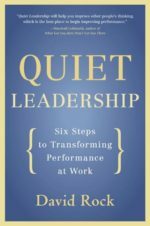 The Six Steps to Transforming Performance are the core of being a Quiet Leader and define a whole new way of communicating in the workplace. David Rock provides a coherent guide to making permanent workplace performance change by unleashing higher productivity, new levels of morale, and greater job satisfaction. I believe he has given us the keys to unlock the future of leadership development. 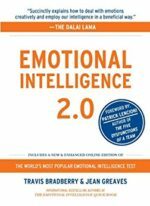 Emotional Intelligence 2.0 provides a passcode for your initial online assessment which will show you where your EQ stands today. The assessment will give you a clear understanding of the specific behaviors responsible for your EQ scores. You will make this your “go to” book while you deploy proven strategies and practices that will increase your emotional intelligence and capitalize on the skills responsible for improving your leadership skills. At least one-third of the people you know are introverts. They are the ones who prefer listening to speaking, reading to partying; who innovate and create but are uncomfortable with self-promotion; who favor working on their own over brainstorming in teams. Susan Cain has filled her book with indelible stories of real people; she shows how dramatically we undervalue introverts, and how may be lost in doing so. She questions the dominant values of American business culture, where forced collaboration can stand in the way of innovation, and where the leadership potential of introverts may be overlooked. 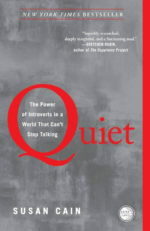 I recommend this book for every introvert because it has the power to increase self-acceptance and I recommend this book for every extrovert because it will provide insights into how you can improve your relationships with introverts. If you are intelligent, competent, hardworking and successful and still often feel like an imposter, this book is for you. This book normalizes the feelings and behaviors that trigger your imposter syndrome and will help you develop self-compassion with the insight that the most successful people are successful because they persisted in the face of many challenges and some failures. 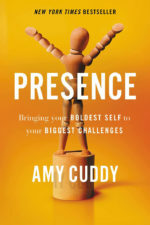 Amy’s book will give you access to ways to harness your power and will allow you to transform and harness the power of your presence boldly. When you access your personal power, you can achieve “presence,” the state in which you can stop worrying about the impression we’re making on others. Amy has filled her book with stories of individuals who learned how to flourish during the stressful moments that once terrified them. You will learn how to approach your biggest challenges with confidence instead of dread, and to feel a sense of satisfaction instead of regret. Let this book remind you what you did right before, help you avoid common missteps, and give you new strategies. The target audience is middle management or a new manager, but I would recommend this quick read as a tune-up for any level. Drawing on more than 50 interviews with respected leaders and her 20 years as a strategy consultant and executive coach, you will have access to new tools, be reminded you what you did right before, ways to avoid common missteps, and some new management strategies. 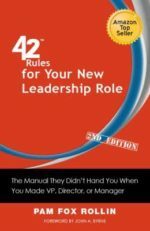 Each chapter describes practical rules and effective actions for you to make a strong start at your new job. Topics include how to gain cooperation from your team, read the business culture at your new level, tee up smart “quick wins”, show others how to work with you, assess the business risks in your new role, make the most of your strengths without overdoing it, work around your weaknesses, use team screw-ups to your advantage, redesign your undoable job, and stay focused on your plan when everyone wants you to fight fires and solve the problems on their desks. After you read Pam’s book, you will want to keep it on your bookshelf as a reference manual or to use to mentor and coach your team. 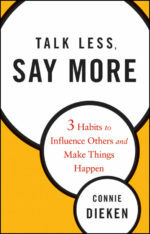 Talk Less, Say More lays out a powerful 3-step method called Connect, Convey, Convince and guides you in how to use these habits to be more succinct in today’s demanding distracted world at a time when communication skills are one of our greatest challenges in business today. Would you like to trigger more positive responses in your business communication? Are striving to be more influential and make things happen? Do you feel a victim of a distracted, attention deficit time-pressed world? Connie’s methodology is targeted to support you in overcoming these obstacles. You will receive specific tips and takeaways to ensure that you’re fully heard and, clearly understood. Say More will help you to elevate your game and achieve more with less – Less wordiness. Less tune-out. Less frustration. You’ll gain more time. More positive outcomes. More rewarding relationships. Are you frequently busy but not productive? Do you feel other people’s agendas are constantly hijacking your time? Are you giving others the implicit permission to choose for you? Do you want to declutter your life? If you answered yes to any of these, Essentialism is a must-read. Essentialism is not one more thing but rather a whole new way. Essentialist isn’t about getting more done in less time. It’s about getting only the right things done. It is a systematic discipline for discerning what is essential, then eliminating everything that is not, so you can make the highest possible contribution and focus on what matters. The disciplined pursuit of less is not just haphazardly saying no, but purposefully, deliberately, and strategically eliminating the nonessentials. 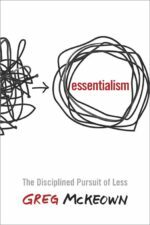 Essentialism, the disciplined pursuit of less will empower you to reclaim control of our own choices and about where to spend our precious time and energy. Essentialism is not one more thing – it’s a whole new way of doing everything. A must-read for anyone who wants to do less, but better, and declutter and organize their life. 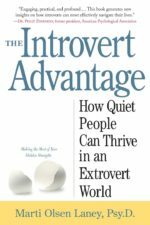 The Introvert Advantage dispels the belief that something is wrong with you if you are an introvert. Instead, it will help you recognize your strengths, analytical skills, ability to think outside the box and strong powers of concentration. Marti’s book provides tools to improve relationships, including ways to talk less and communicate more, how to showcase your abilities at work, how to deploy successful strategies for socializing. By taking advantage of your unique qualities as an introvert you will not just survive, but thrive while you create a life that’s just right for your temperament. You will discover new ways to expand your energy reserves, and even how, when necessary, to confidently become a temporary extrovert. 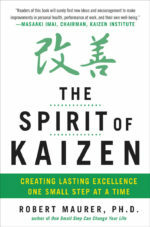 Discover the power of KAIZEN to make a lasting and powerful change in your organization. “Maurer uses his knowledge of the brain and human psychology to show that continuous improvement will build the foundation for teams to courageously using their creativity. Kaizen is much more than a world-class management practice; it is a technique to remove fear from our mind’s mind, enabling us to take small steps to better things. The process of change starts with awareness and desire in our minds and then leads to action and change in the physical world. You will find new ideas and encouragement to make improvements in personal health, performance at work, and your well-being. Today’s businesses love the idea of revolutionary, immediate change but these significant “disruptive” efforts often fail because radical change sets off alarms in our brains and shuts down our power to think clearly and creatively. Kaizen begins with one small step and has proven to be more effective, lasting and powerful path to change. Small is the new significant! We have all heard about the many benefits of mindfulness practice, but I often hear from my clients that they don’t have time for a “mindfulness practice” in their busy lives. Consider the possibility of integrating mindfulness into your day this is often referred to as “Mindfulness off the mat” – the awareness that arises through paying attention, on purpose, in the present moment and non-judgmentally. Mindfulness can reduce stress, improve physical health, your quality of life, and give you deep insights. 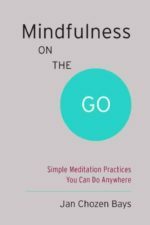 Mindfulness is available every moment, and Jan’s pocket-sized book provides twenty-five mindfulness exercises that can be done anywhere. Use them to cultivate the gratitude and insight that come from paying attention to your body, heart, and mind throughout each day. I recommend this book for your desk, not your bookshelf. Becoming mindful doesn’t just happen overnight. It is like anything else in life… it takes practice. Sometimes the test of a good book is how it survives the test of time. Originally published in 2006, sold over a million copies and published in 22 languages this book is a classic. The Speed of Trust offers a practical look at exactly how trust functions in our every transaction and relationship. Trust operates like a ripple in the pond, The Speed of Trust begins within each of us personally, continues into our relationships, expands into our organizations, and ultimately encompasses our global society. A powerful guide on how to establish trust immediately so that you and your organization can attain trust as a measurable accelerator to performance. 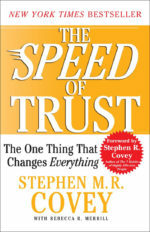 Covey explains that when trust goes down, speed also decreases and up costs increase. The Five Waves of Trust model serves as a metaphor for how trust operates in our lives. Covey presents a framework for understanding and making trust actionable, including a look at the Four Cores of credibility and the 13 Behaviors of high-trust leaders.